Grease and flour a 9-inch tart pan with removable bottom. Combine all crust ingredients in a bowl with a fork until well combined. Place crumb mixture in the tart pan and press with your fingers (or the back of a measuring cup) evenly and firmly onto the bottom and up the sides. 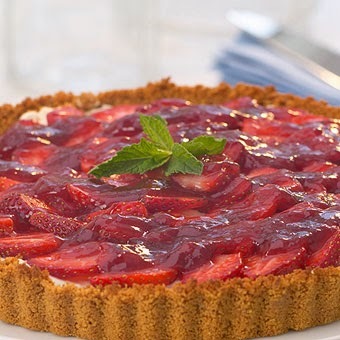 Bake the graham cracker crust until crust is firm to touch, about 8 minutes. Cool on rack. Using an electric mixer beat cream cheese and sugar in a medium bowl until smooth. Beat in sour cream, lemon juice and vanilla. Spread filling in cooled crust. Cover and chill until firm, at least 4 hours or overnight. Heat jam in a small saucepan or in the microwave until it is spreadable but not hot. Drizzle jam over berries. Serve.